On the last day of January I took a stroll around Alameda Point, a vast wasteland of decrepit structures abandoned by the Navy and now studded by the ventures of brave entrepreneurs, from wineries to an athletic club. You never know what you’ll find going on at the Point: A fugitive hiding from the FBI. A massive study of new technology by the Department of Transportation. Maybe even a tightrope walker. 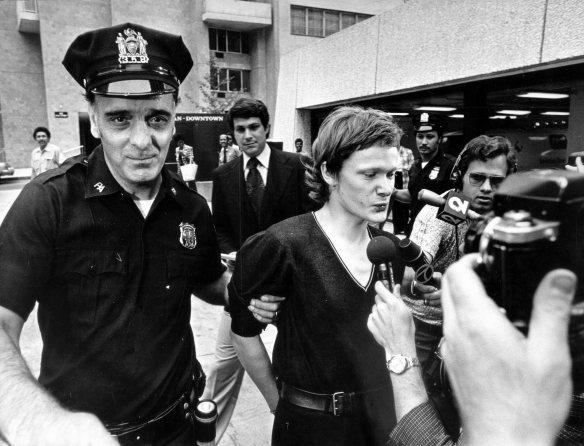 In 1974 Philippe Petit famously (and illegally) stretched a tightrope between New York’s Twin Towers and negotiated the 200-foot gap eight times before surrendering to police. This has been called “the artistic crime of the century,” and was immortalized in Colum McCann’s “Let the Great World Spin,” a novel which earned him the National Book Award in 2009. 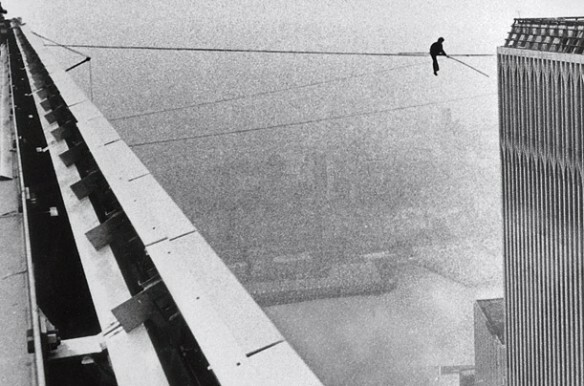 … the tightrope walker was such a stroke of genius. A monument in himself. He had made himself into a statue, but a perfect New York one, a temporary one, up in the air, high above the city. A statue that had no regard for the past…. So brash. So glassy. So forward looking. And then there was the tightrope walker at Alameda Point. A young woman winched a cable perhaps 6 feet long between two pipes outside the business from which, most likely, she was on her lunch break. I did a double-take, and by the time I looked back, she was already perched atop it, balancing about four feet off the ground. The cable swung violently side-to-side for a moment, but the walker’s head remained perfectly still, the pivot of a pendulum, and she regained her balance. She glanced up at me as I passed across the street. I smiled and kept walking, not wanting to distract her or intrude on this moment. But what was that moment exactly? Why was she on that wire? I wondered if she was a performer in a local nouveau cirque troupe, another artist with a day job. Was she preparing for the next great artistic “crime,” or was this all the performance she ever hoped to give, though no one witnessed it but me? A journalist in a flat white hat shouted, “Why?” But the word didn’t come into it for him. He didn’t like the idea of why. The towers were there. That was enough. Whatever her motivation, whatever that moment was, it was magical. It was a thing of beauty in the most humble surroundings, a flower breaking through concrete. She was a living and breathing metaphor for walking the tightrope to find balance in our lives. She ran away and joined the circus, if only for an hour. This entry was posted on Tuesday, February 7th, 2012 at 6:05 pm	and is filed under Musings. You can follow any responses to this entry through the RSS 2.0 feed. You can leave a response, or trackback from your own site.